I should probably have a section of this website called “Outliers” or something like that, for paintings that seem to show up like birds far away from their usual range. One wants to welcome and feed them in accord with ancient customs of hospitality to strangers. But how to explain them? I've heard parents marvel at how different their children are from each other and how their lives take shape with a momentum over which parents have only distant sway. Artistic practice can be like that. The painting at hand arrived some years ago in my studio during a period of experimentation with complex, interwoven patterns. The roughly patched surface presages a mode that I'm only now exploring more fully a dozen years later. There are many paintings from the “Outliers” bin that have long since been painted over in search of something more comprehensible, but this one I've held on to, perhaps because it still puzzles and delights me. It's two panels of acrylic on stretched canvas, with attached fabric, 42 x 72 inches overall. I read in the news last week about a woman in Austria who was unharmed but frightened out of her wits when a hand grenade exploded in her woodstove. Apart from breaking the glass in the stove's door, the stout little stove contained the blast. An investigation revealed that the grenade was left behind from World War II and had over the years become completely enveloped in a tree, which was then cut down for firewood. I've been reading Mark Twain's Innocents Abroad, a detailed account of his 1867 excursion to the Mediterranean and the Holy Land. His descriptions of various horrific Old Testament battles – especially in what is now modern day Syria and Palestine - leave this contemporary reader wondering what's in the water over there. What is left behind after a war? When does it later explode? The endless tangle in the Middle East is a five thousand year old re-cycling of a few tenacious grudges. The Holy Land indeed. And what could any of this have to do with a blue-green painting of a Japanese World War II fighter plane? Maybe nothing. Or maybe recycling scraps of cloth into a benign and strangely beautiful image of an obsolete, “enemy” machine of war could help to pacify seeds of vengeance. 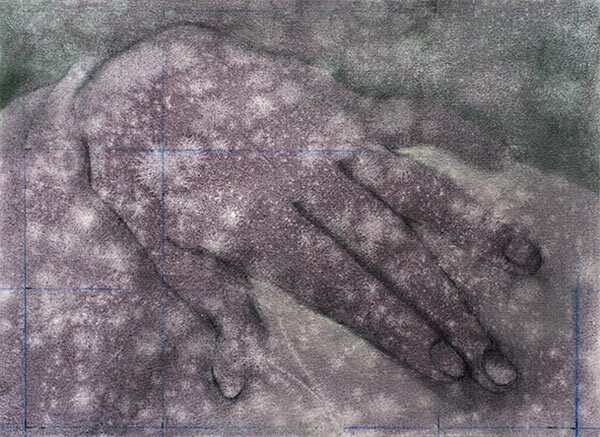 I just ran across this painting – it's part painting, part drawing – from a series of hands done in 1996. In my Advanced Drawing class at Naropa we work on a semester-long project called The One Hundred Drawings project. There are many examples of this in art history, both eastern and western, traditional and contemporary. One well-known set is from the nineteenth-century Japanese artist Katsushika Hokusai: his famous One Hundred Views of Mount Fuji. The number one hundred is a lot of things to do on one theme, but once you get rolling with an idea it opens up many possibilities, sometimes from a kind of creative desperation, if nothing else. To work alongside my students in that year's class I chose hands as a subject. Most of them were done from images of fashion models' hands in magazines, so they all seem to be the hands of young women. This had the not-consciously-intended effect of giving the series a quality of feminine mystery. Perhaps the crass sexualizing of women in western popular culture is a distorted expression of atavistic reverence for the feminine, with lines disappearing back into the mists of time where we can at least dream that women were equal partners in the business of life. 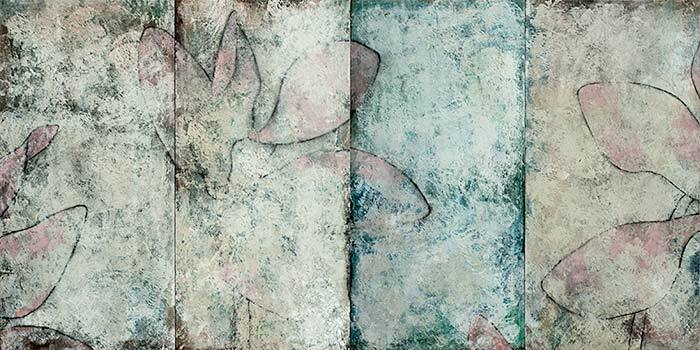 This piece and the whole series were done with acrylic and charcoal on unstretched canvas. The size is 22 x 30 in. Here is another in the series of fighter planes from the Second World War. I finished this one just last week. The subject, a Junkers JU-87, also known as a Stuka dive bomber, was rolled out by the German Luftwaffe in 1935. I was previously reluctant to do any of these paintings of “enemy” aircraft, having grown up with the echos of World War II. One of the features of impermanence is that over time friends become enemies and enemies become friends. (Although it's amazing how long a people can hold a collective grudge – many centuries in some cases.) With Germany, however, we should be glad that we are once again trading in automobiles, beer, and yodelling (or am I thinking of Switzerland?) Then, as now, the Germans made really good machines. Their war equipment put this engineering skill to diabolical use. It's strange to say so, but this plane, and many others made by all sides in the conflict all possess a stylish poetry that I can't quite grasp. What is that? The painting is a three-panel piece, 26 x 66 inches overall, done in acrylic with a surface built up in layers of cut canvas, cheesecloth, modelling paste, and gesso. This is not a painting (yet). It's one result of an exercise in my Contemplative Artist class called “The One-Spot Photo Gathering”. This practice can be done with any digital camera. For these images I used an iPhone set on square format. The exercise is to take a seat indoors or out and become rooted to this spot. Without moving from this location and using your camera's viewscreen, notice the infinity of possible compositions in view. Settle into your spot for a half an hour or more and let images come to you. Gather the images with a mind of receiving rather than one of taking. By the end of a session of this practice you should have a collection of about two dozen images. 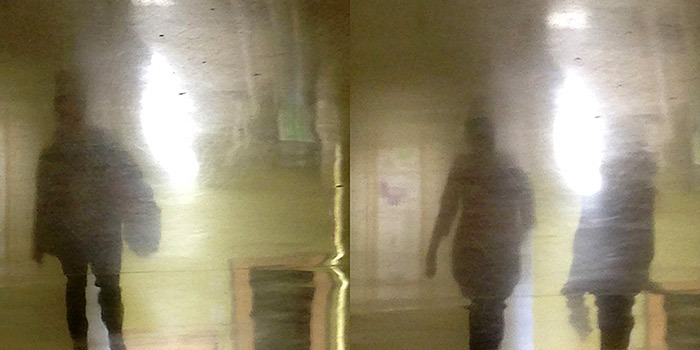 The pictures here are reflections of people walking in a hallway with a polished concrete floor. There is no digital manipulation other than joining two photographs into a diptych and turning the image upside down. This painting is the only remaining section of a much larger experiment from about twelve years ago. At the time, I became interested in the many ingenious patterns that show up in weaving, pottery, tilework, book illumination, and elsewhere. This pattern, sometimes called double wedding-ring, has been popular among quilters for at least a century and a half. I first saw it in a book of tile reproductions. The tile layout was easily adapted to the kind of multiple panel paintings I keep re-visiting. Perhaps one reason I've kept this painting is that something happened during its painting that provided me with an insight, what the British artist Bridget Riley calls "discovering the picture plane". She has a way of talking about this that makes sense experientially: the direct discovery of the very surface on which you are working as you are working it. Within this recognition a kind of aesthetic intelligence kicks in and the possibilities become both endless and unerring. This doesn't happen every day of the week. Even though I'm not all that crazy about this painting, when I look at it now, years later, something about the surface itself still stores whatever that quality is. Here is a triptych painting/collage of a Mikoyan-Gurevich MiG-III, a fighter plane introduced by the Russians at the outset of the Second World War. It was a handsome design, intended for high altitude aerial combat and capable of dizzying speed. Unfortunately, it was a difficult plane to fly and many pilots died in accidents, both during the testing phase and in combat. These shortcomings and other serious design flaws made the MiG-3 easy prey for the superior German Messerschmitt fighters and it was mostly withdrawn from combat early in the War. The painting itself is done on a surface created more than ten years ago for another – and certainly more modest – but also ill-fated venture: a series of paintings based on the number three. Some of the experiments I did on this theme were for a show at the now-defunct MacLaren Markowitz gallery. The gallery staff were so horrified by the work that they took the show down and placed the pieces out of view in the back storage closet. The paintings weren't really that bad and they were certainly not offensive, but I would have to agree that they weren't that good, either. It was satisfying in any case to put the surfaces to good use years later for this ongoing series of World War II fighter planes. This painting was done in the late 1980s during a time when I was caretaker at a remote retreat center in southern Colorado. It was part of an experiment of adding invented colors to observed landscapes, somewhat in the mode of the Fauve painters in turn-of-the-last-century Paris. Sometimes I was deliberately using complementary colors, such as red instead of green, etc. It was liberating to mix invention with observation and discovering that they were already in a dance anyway. In the early 1980s while living in Boston I noticed a rack of “generic books” in the local supermarket. They mimicked a style of food product that had become a fad of sorts: bare-bones packaging with no attempt to seduce the buyer, just black print on white background with ingredients listed, items like “Beans”, “Cereal”, and “Beer”. The books that came out at this time were billed as “no-frills entertainment”; they were published by Jove Books as a tongue-in-cheek marketing scheme. They had titles like Romance, Science Fiction, Mystery, and so on; with plot ingredients listed in dead-pan language. Why am I telling you this? Well, the author of Mystery was Clark Dimond whom I met some years later after moving to Colorado. I found out quite by accident that he had been commissioned by Jove Books to ghostwrite the very book I'd seen in Boston. And isn't he the owner of this painting! Why yes, he is. I finished this painting yesterday. 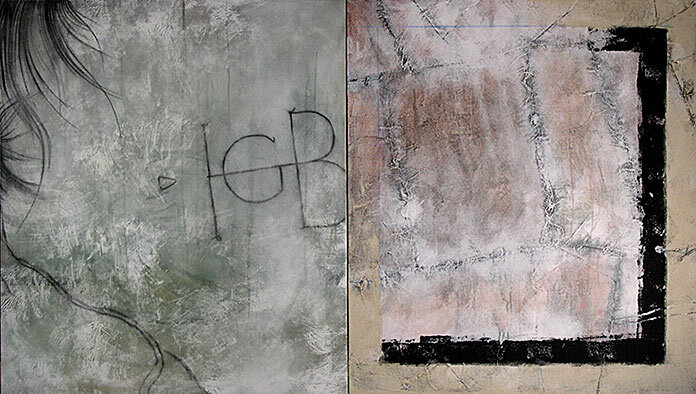 It's three-panels on canvas with additional collaged canvas and cheesecloth, 26 by 66 inches overall. I'm re-visiting a theme of fighter planes from the Second World War; I started these in the summer of 2012. The Brewster Buffalo was one of the early monoplanes to enter the War from the United States. 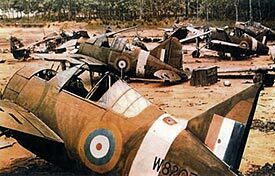 In the south Pacific air combat it was outdone in speed and maneuverability, especially by the Japanese fighters whose seasoned pilots overwhelmed the untested pilots arriving from the U.S., Holland, and England. The U.S. Marine Corps pilots called the F2A “a flying coffin”. In Finland, however, it was very successful in fending off the various Soviet fighters of the same class. (The Finns allied themselves with the Germans – not out of any affection for the Nazis but rather out of a fear of Russia, their common foe. So in one of the strange twists of warfare, American-made planes, some of them emblazoned with swastikas, were fighting alongside the German Luftwaffe against Russia, a nominal ally of the United States.) There were only some five hundred of these planes made, and they were quickly superceded by faster and more maneuverable planes. I don't know if there are any of them left flying these days, and most of their surviving pilots have died. Papillon de Nuit is the French for “night butterfly”, what in English is called a moth. 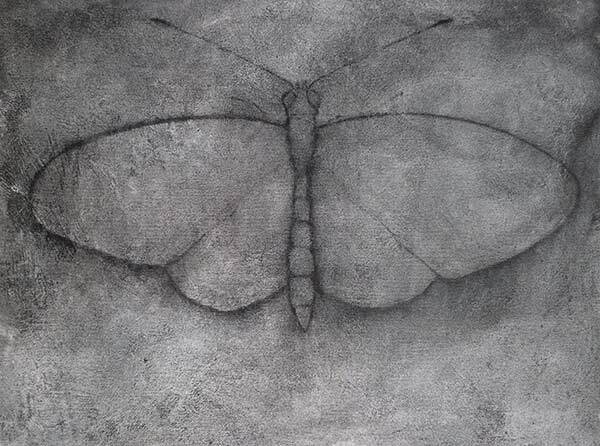 The work pictured here is a charcoal drawing on a prepared canvas. I did this about six or eight years ago during a period of experimental visual austerity. I will often begin a painting with a charcoal drawing, a method in general use for about forty-five thousand years. I noticed that these “preliminary” drawings had a quality that was obscured in the process of painting – and I missed this quality. So during this period of time I did numerous charcoal drawings on canvas with no intention of painting them over. I still enjoy looking at these. Many of these pieces seemed to impress people in the same way that half baked bread impresses people. Butterflies of the Night would be a good description of how ideas and insight arise: they flutter capriciously and quietly in our vicinity usually without lingering too long. This is why attention is generally regarded as a good practice. At first viewing, this triptych, done some time in the late 1990s, might appear to bumble into gratuitous mystery. But wait, there are some connections. The water meadow is an actual place in southern Colorado: a spring-fed, hidden meadow, green even in the driest of summers (and it gets dry there!). The woman is a late-twentieth century goddess, her reverie partly obscured by the grid. The "weed" is False Solomon's Seal (Smilacena racemosa), a common plant that grows in the vicinity of the water meadow. 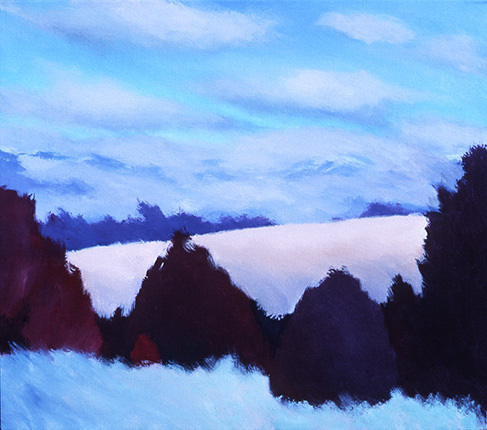 I did this painting as a diagramatic supplication to a place, which we call Mountain Water, purchased in 1996 with a hopeful vision of creating a refuge for artists. Much life has passed between then and now and the future of this vision is uncertain. Meanwhile, the land with its water meadow, drought-hardened denizens, and its whispering goddesses still haunt the imagination. 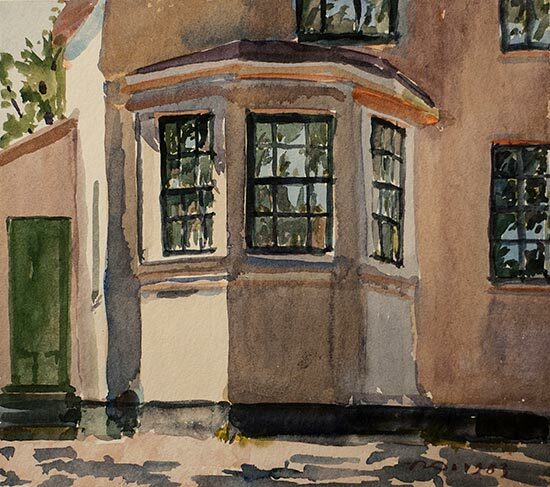 In 1983, while still living in Boston, I spent a lot of time outdoors painting in watercolor. I've continued this off and on since then. The specimen here is from the campus of Lasell College in Newton, Massachusetts, just outside of Boston. At the time, I lived nearby, and the campus was mostly closed up for the summer. There were a number of old houses probably used for administrative offices, and it was possible to settle in and work without molestation. This one has remained a favorite of mine in spite of its crudeness and “errors” of perspective. Sometimes I paint in watercolor without any preliminary pencil sketch, just plunging in and relying on the color and light and dark to carry the image. It's a risky approach with a fairly high rate of failure, but when it works, something of the vividness finds its way in. 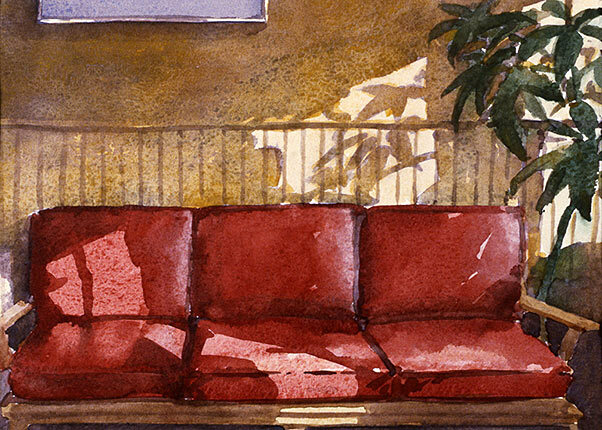 Here is a link to watercolor work from this period, work that I still enjoying seeing thirty years later. I was recently a panelist hosted by ARTology, a group of energetic artists organizing public conversations among artists, academics, and business people in Boulder. The topic last night was Purpose. I was apprehensive that the event might be a painful exercise in problem-solving and civic boosterism, worrying as I do about the place of art in any discussion of our perilous human condition. It turned out to be okay, maybe a little flat, but it's hard to know what satisfies people's hunger these days. What does any of that have to do with this watercolor? I suppose I picked it out because of its ordinariness, done in the woods without fanfare, something like our recent panel. One of the recurring themes of our discussion was wholeness, a sense of contentedness, having enough; and the reminder that artistic practice of the most ordinary sort can lead to a recognition of wholeness, completeness. If you feel complete, you don't consume so much. If you feel whole it seems natural to be curious about people and things and not so much about your self. This is no small thing if you multiply it by the billions of us on the earth right now. Our needy habits are neither fulfilling nor necessary, and are proving to be catastrophically expensive. 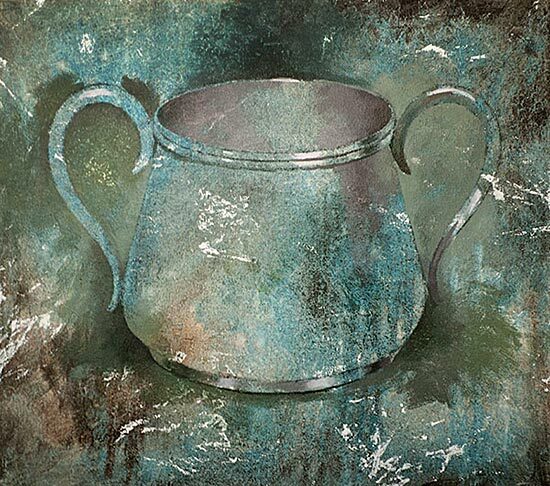 This is one of a number – a large number, actually – of watercolors done in the woods in dappled sunlight. I suppose it could be an overworked theme in painting, but it still works for me. A recurring and fertile practice in painting is to inhabit the demilitarized zone between realism and abstraction. If the resulting work can sit comfortably at either table, that's good. Painting this way can serve as a portal into a non-fixed realm of perception, for both the doer and the perceiver. The habit of mind to solidify and name things has obvious utility, but it comes with a price: we miss the vital, unnameable, continuously changing nature of reality itself. Knowing how to enter this zone of both recognizing and not recognizing is called non-fixation. Seeing phenomena as both familiar yet dreamlike, simultaneously real and unreal is one of the great and mostly overlooked benefits of paintings. I have for years been intrigued by deteriorating artwork, even deteriorating posters on walls. It is as though the elements are participating in the “look” of it. Perhaps what is appealing is that the participation is unselfconscious, without hidden motive. I find myself mimicking this deterioration, and the “letting it be” quality in painting. The Cyclamen Screen is an early attempt at this. I recently spent two weeks in Paris, with a few day trips out, including one to the Cathedral of Chartres. 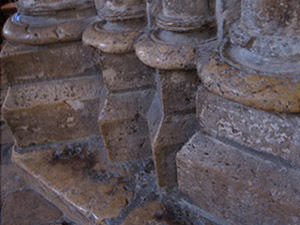 Among the many moving qualities of a place this old is the evidence of human presence: the stone columns and floors are polished by millions of passing hands and feet over many centuries, as you can see in the photo at left. The Cathedral in its present form was built mostly during the 12th century of the current era on a site that had been the location of two previous cathedrals, both of which were destroyed by fire. What either of these two things –cyclamen screens and cathedral stones polished by devotion– have to do with one another I'm not sure. Maybe it's the effortless activity of time and phenomena acting as they will. Inventing this was enjoyable and surprisingly easy. It made me realize again that fraud can be a way to engage the world. It's what we're doing most of the time anyway, isn't it? A few years ago I was in a similar tight spot with updating this part of my website (which I also refresh on the new and full moon). At that time I wrote about having stayed on a remote island off the coast of Scotland called Ishfindatl. If you google “Ishfindatl” it actually shows up! In fact it's the only thing on the web by that name right now. These two watercolors were not done as a pair and I'm not sure they belong together anyway. But here they are. A lot of less-than-ideal things (or people) get paired up with each other; some of them figure out how to make it work. These two happened along last week as I was trying out some paper I bought on eBay. I'm always on the lookout for the occasional trove of watercolor paper abandoned by an artist or left behind by the dead — especially if the paper has been around for a few decades, which was the case with my recent purchases. If it has been stored in a reasonably dry place, good quality watercolor paper gets better with age. There is a hidden cost to searching for watercolor paper on eBay: you have to be willing to plow through hundreds of cat and poodle paintings for sale. So what about these two? 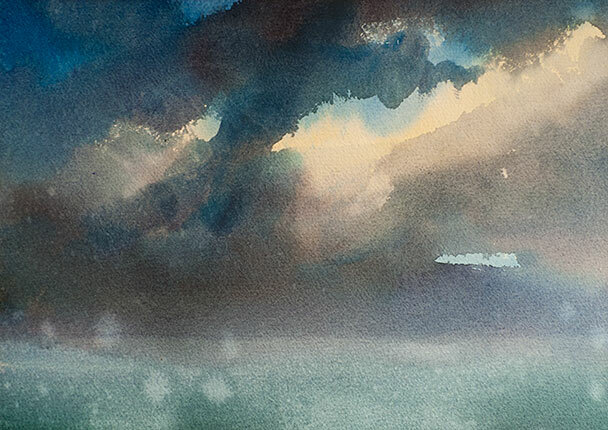 I've been doing variations of these “dramatic-skys-by-the-sea” watercolors since I was about twelve years old. The pair at hand are inspired by dream visits to County Kerry in Ireland; they favor a kind of watercolor painting that perches on the threshold of chaos: very wet with the constant necessity of surrender. Here's a watercolor from 1995, done in the woods near the boundary of the Libre Commune and the San Isabel Wilderness Area in southern Colorado. It's called Dry Creek. There must be several hundred creeks by this name in the American southwest, which tells you something about the regional climate. No one seems to think too much of this painting but it's always been a favorite of mine. I think it's because I realized while painting it that you could look at any aspect of visual reality and compose it as you wish. This is something we do anyway whether we realize it or not; and I'm not just talking about painting here. We make out of our experience what we make out of it, and we forget how much choice there could be in doing so. Paul Cézanne is one of my favorite painters. I had always assumed that he employed the kind of re-arranging that I'm talking about here –at least in his paintings. In the late 1990s, a painter and scholar named Pavel Machotka traipsed around southern France and photographed the scenes where Cézanne painted, as precisely as possible from his original viewpoints. This investigation appears in a marvelous book, Cézanne: Landscape into Art (from Yale University Press). I was astonished to see how faithful Cezanne was to the arrangements of trees, rocks, and buildings he painted. What he rarely lost sight of, however, was that arranging paint on a canvas is never to be confused with trying to replicate the illusion of something. So maybe we are talking about the same thing. I did this watercolor in Boston in the early 1980s. The red couch in the picture I'm calling The Adaline Sofa was in the basement “rec” room of 3529 Adaline Drive in Stow, Ohio where my wife grew up in the 1950s and 60s. This couch was purchased by my parents-in-law probably in the 1950s. It has a long, strange life. After many years and early TV programs in Ohio the couch moved to Boston where it inhabited several of our painting studios. When Joan and I moved to Colorado in 1985, the couch spent six years in the sitting room of a local Buddhist center in Boston, where it picked up a few stains and some chewing gum. In 1991 it moved from Boston to Boulder, Colorado where after a good cleaning it now resides. In the strange cycles that life concocts, my parents-in-law, by now in their early 90s, moved in with us in Colorado and were re-united with the couch where they spent many an hour reading and visiting. 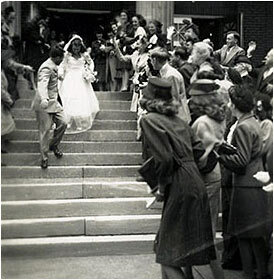 Here they are –Jim and Jan– on their wedding day in 1945, Jim just back from the European theatre of World War II. It was the beginning of a long and charmed marriage. Many believe that the things surrounding us—the things we sit on and cook with and wear—take on something of the lives we live until they, and we, are dispersed back into the elements. Probably twelve or more years ago I started a series of two-panel works in which I was deliberately pairing things that had no obvious reason to be together, mimicking the kinds of spontaneous and sometimes absurd juxtapositions that occur in life. Recently I noticed a car that had been purchased at a dealership called Saturn of Seekonk. Seekonk is a town in Massachusetts formerly inhabited by the Wampanoag Indians. (The name Wampanoag means “People of the Morning Light” because they were the first to see the sunrise; Seekonk was the name they called their land.) Saturn was a Roman god and a planet with rings and winds that reach 1,100 miles per hour. Saturn of Seekonk. It so happens that the hair on the left panel is a detail from a late Renaissance drawing of Saturn (the god, not the car). I'll look up the name of the artist tomorrow. The right panel is very rough burlap organized with no sense in mind. At the time, I was curious about what happens when we're confronted with things that make no logical sense, like Saturn of Seekonk. Perhaps these paintings don't go any further than that: they just make no logical sense. This one is a fairly large one from that time; it's 84″ by 48″ overall; it's a combination of acrylic, charcoal and gesso on canvas with burlap and jute. This watercolor has the the title Portmagee Channel, although someone from the Irish town of Portmagee wouldn't necessarily recognize it as the waterway between themselves and nearby Valentia Island. Since 1970 there has been a causeway from Portmagee to Valentia. My friend Eilís Dennehy, who, along with her husband Tom, own the nearby Sea Breeze Bed & Breakfast, grew up on Valentia. She was a schoolgirl before they built the causeway and her daily trip to school included a boat ride to and from the mainland in all weather. It isn't a wide channel, but an island is an island after all. I'm told that even with all the changes over the last century the islanders still look out for each other. In the late 1800s a mass exodus to America and elsewhere decimated the population, which must leave a lingering sadness in a place, even though all the broken hearts have long since stopped beating. Ireland's recent boom and bust economy has been a diffult thing to watch from afar. I hope that the collapse of the real estate frenzy will, in the long run, be a blessing for this ancient and beautiful land, sparing it some of the latest ravages of human folly.